Krrish 3 is an unlikely cocktail of cool, shiny technology and outdated treatment. I’m going with two-and-a-half stars for the film, and an additional half star just for Hrithik Roshan, which makes it three out of five for Krrish 3. The film is ambitious but flawed. It is, however, consistently watchable for its terrific lead star who you can’t take your eyes off, even for a moment. KRRISH-3 is a technical marvel .On the whole, KRRISH-3 has the ingredients that make a splendid superhero film, besides being Rakesh Roshan’s most accomplished work so far. Besides a riveting plot, the film scores brownie points thanks to the strong undercurrent of emotions, the clash between the protagonist and antagonist/mutants, the awe-inspiring visual effects, the larger-than-life entertainment and of course, Hrithik Roshan, who is matchless in this avtaar. It’s a Diwali bonanza for moviegoers across the globe and is sure to conclude the celebratory period on a high. BLOCKBUSTER. On the whole, Krrish 3 is a box-office bonanza which will write box-office history. It will do outstanding business and will emerge as one of the biggest blockbusters of Indian cinema. In spite of lack of comedy, romance and hit music, it has tremendous repeat value. Let it be said loud and clear: Some films are destined to write box-office history, and Krrish 3 is one such film. It is: Avatar meets Superman meets Indian sentiments! Krrish 3 is ambitious and exciting. Sadly, it’s also derivative, clumsy, convoluted and far too long. The two main flaws are the story and the music. The action is terrific but the special effects range from tacky to impressive. Krrish 3 isn’t a patch on the best superhero films made in Hollywood but it is a step forward for Bollywood. Somewhere in the future of this franchise, the superhero concept and the requirements of mainstream Hindi movies will merge seamlessly. Until then, cut the Roshans some slack and enjoy. I’m going with three and a half stars. With a visually riveting and emotionally engaging story, intriguing characters, sweeping VFX (unseen thus far on Indian celluloid) Rakesh Roshan’s ambitious dream lives up. Yes, it’s hugely inspired (by the Bats, Spideys and Wolverines of the West), but our superhero has his own ‘X-factor’. Even with all the high-octane car crashes, explosions and ‘animatronics’, the philosophy is the force behind it all, yet, never overpowering the story. For sheer vision, bravado and superlative execution, this one soars to new orbits. Latch on to this cape for an exhilarating ride. Note: You might not like this film if sci-fi, fantastical films are not your scene. Krrish 3 is a film for kids. Despite the relentless violence and a clobbering of the senses, there’s nothing here for anyone older than age 9 (let’s hope they still believe in science over god). Once you accept this, it’s a film easier to digest. And you won’t even question where Krrish 2 went. Krrish 3 could have been a much better film if it had been a tad more original. The blatant plagiarism from other superhero films, the absolute lack of creativity, has made me lose respect for the makers and the film itself. In conclusion, after watching Krrish 3, all I can say is that I need a therapist. a film ostensibly made for kids but one so abysmal that you should be most concerned if your children (or your nephews or your neighbour’s kids) want to see this. If they grow up actually liking movies like this, well, there goes the next bloody generation, conditioned for mediocrity from the get-go. Krrish 3′ is a superhero film. It is also a throwback to the creaky family entertainers Bollywood used to make. Superheroes have been around in Hindi cinema for decades, but huge technology jumps have made ‘Krrish 3’ the slickest of them all, special effects-wise. The rest of it is marred by tackiness. Krrish 3 is, for the most part, impressively ambitious and dazzlingly competent, if not always riveting. The special effects are jaw-dropping all right and some of the action sequences are superbly well executed. Mercifully, the film doesn’t. It passes muster because of the consistently high quality of its CGI and the undeniable power of a known franchise. In Krrish 3, familiarity breeds an easy connect.
. It has something for everybody. For a superhero film fan there are fantasy characters, a super villain, full scale heroism, plot twists and superb action. For a Bollywood fan, there is enough emotion, drama, love story and songs. The film — aimed more at kids, than adults gets a little complicated at times, making you wonder if the young ones will be able to grasp it. It is highly derivative. It borrows heavily from almost every superhero film you have seen. Take the most superficial components of X-Men, Batman, Superman, Spiderman and even Shaktimaan; stuff them together in a litter bag, set that bag on fire and inhale the fumes – that’s pretty much what Krrish 3 feels like. this is a movie that has desi versions of pretty much every character from every American superhero series. as you watch Krrish 3, because really, the film is just a filmmaker calling you a moron for two and a half hours. The shabby acting, pathetic dialogues, over the top melodrama and zero presence of screenplay could have been ignored but what remains unforgivable is its unoriginal sequences. The lack of novelty is gravely dissatisfactory as the film has absolutely nothing to flaunt except their gusto to try something spirited of this magnitude! 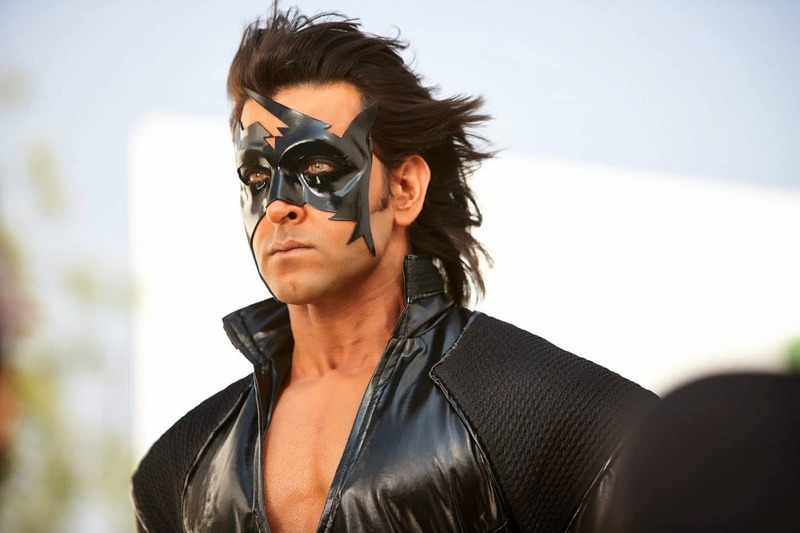 Overall, ‘Krrish3’ will turn out to be a fun adventure for the little kids and Hrithik loyalists. For the rest of us, it’s going to be just another superhero attempt in the right direction. Hopefully, it won’t be long before we get our very own superman! In Krrish 3 there is family drama, a desi story, bad guys who won’t quit and of course, a superhero! Rakesh Roshan makes sure you are entertained throughout, be it because of the special effects or the masala plot. Krrish 3 is a worthy addition to the franchise. The final verdict? Yes, Krrish 3 is not perfect. But it has all the elements a good, entertaining film must have. All you Marvel superheroes, better watch out. Krrish is here to stay.